The Cato Institute Hits A Home Run! http://www.cato.org/bannerads/disagree2.swfOver 300 economists are saying NO DEAL! I want to thank Rev. Amy over at Rabble Rouser Ruminations for including a very interesting link in her current post titled “They Pretend to Work, We Pretend To Pay”. It seems that we are not alone in believing that the American Recovery and Reinvestment Plan (common sense translation: Bloated Liberal Spending Bill) proposed by Nancy, Harry and Bambi is a REALLY BAD IDEA. I think everyone should let The Cato Institute know how much we really appreciate them for standing up against the very event that will plunge our country into another Great Depression. I for one do not feel like being doomed because some people seemed to have failed American History class. President Obama says that “economists from across the political spectrum agree” on the need for massive government spending to stimulate the economy. In fact, many economists disagree. 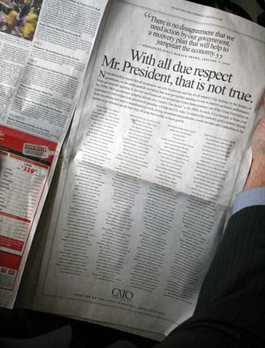 Hundreds of them, including Nobel laureates and other prominent scholars, have signed the statement that appears in the Cato Institute’s ad in the New York Times, Washington Post, and in other national publications. Hey, thanks, DT! Glad I could be of service! Of course, I didn’t have the very cool graphic way of putting up the ad that YOU do – holy cow!! You’re amazing! Obama has admitted that he doesn’t even know what is in that humongous spending bill. He gave free rein to Pelosi, Reid, and their co-horts to throw in the kitchen sink along with his pet ACORN projects. I think he felt that if there was enough slop in the trough for the pigs that his pay-back to ACORN would be overlooked. I hope there are enough sane members left in the senate to stop this farce. If he keeps tempting senators with posh positions, (Clinton, Judd Gregg?, etc) the senate will soon be comprised of Obamabots and he will have no opposition whatsoever. IMO he is not so much interested in most of the pork in the bill, he just wants to see it pass so that he can tell the American people that he is really trying hard to save the economy. What he is actually doing is looking forward to the next election. He is all about running and winning. What happens after he doesn’t seem to be concerned with. IT’s all a game to him. Got to love the Cato Institute. It is a very good place to get information. That is where I found Gregg’s bizarre belief about guest worker VISAs….How can the VISAs possibly stimulate the economy! It’s got to the point that I don’t dare miss a day even when you say you are off researching. I come back to find I’ve got three posts to read. Learning so much, I think I’m going to transform into another being. TY, Diamond. I am off researching – these are just little tidbids compared to the socialism and fed series.